Gareth Bale will miss Real Madrid's match at Athletic Bilbao on 2 December with a recurrence of a calf injury. 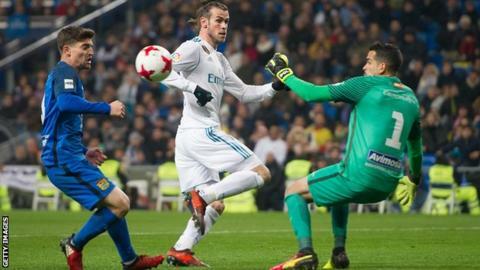 The Welshman, 28, returned after two months out and made two goals in Real's 2-2 draw with Fuenlabrada in the Copa del Rey on Tuesday. But manager Zinedine Zidane confirmed Bale would was again sidelined. "Bale hasn't got anything serious. It's just a bit of discomfort and we don't want to risk it," Zidane told the club's website. "He's got real power and he has to be fully fit to play. With it being in his calf, we really want to fix this problem. "We can't forget that he's a key player for us and when he's fit, he's capable of unbelievable things. We have to be patient." Despite saying the injury was not serious, Zidane refused to put a timescale on a possible return. "That depends on him. I hope it'll be next week. I believe in Bale, as does everyone else," he added. "The most important thing is that he feels fit enough."